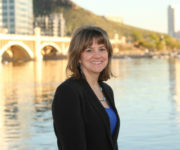 Lauren Kuby is running for reelection to the City Council in order to continue building a sustainable future for Tempe. During her tenure in office, Ms. Kuby has advocated for policies ranging from equal pay to environmental protection to campaign finance reform. In 2012, the Arizona Republic named Ms. Kuby one of five “Tempe newsmakers” who impacted the city over the course of the year. 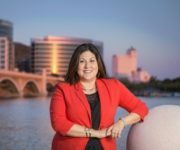 If reelected to the City Council, Ms. Kuby will continue fighting for her vision of Tempe as a “compassionate,” “diverse,” and “innovative” community. On February 19, 2018, Ms. Kuby took the time to be interviewed by PPAA, offering insight into her background and the motivations behind her candidacy. My family always told me that I was bound for a life of community service. I trace that path back to 1958, when my parents were volunteering for JFK’s senate campaign in small-town Massachusetts. One day, JFK unexpectedly visited, with no entourage, our local campaign office. He asked for coffee, and my dad raced home to percolate a cup, leaving 8-month-old me and my mom alone with the family hero. “Your baby makes me miss my Caroline. Can I hold her?” The story of JFK rocking me as a baby became family lore and a large part of my identity.